Spirit of the Game will be made - and it will be made extremely well! I have long made the commitment to myself that in my lifetime I will create one outstanding animated project that will aspire to take the great art-form of traditionally hand-drawn animated storytelling forward. I now very much believe that 'Spirit of the Game' will be that film. I would humbly invite all who share my dream to help myself and my top-talent production team by contributing to it. Hollywood is so very disappointing these days - with its myopic vision of what an animated movie should be - and traditional hand-drawn animation is not even on its radar any more! 'Spirit of the Game' will change the game as far as I am concerned. This indie-style production will transform the way that everyone will view modern 2D animated storytelling and make us all wonder why this couldn't have been done before! 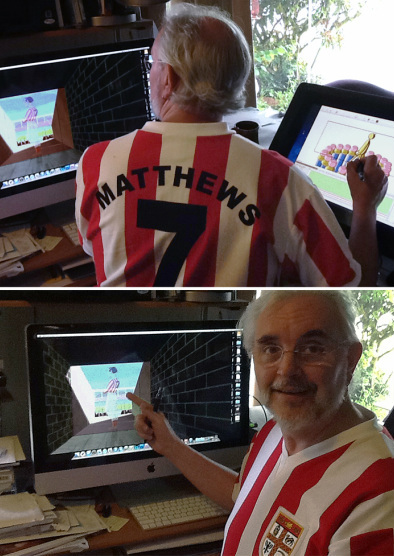 Stanley Matthews' daughter, Jean, said of these pictures when she saw them... "It's great. At first glance Tony looks like Pop!" There's a lot to be said for the 'method' school of animating'! 'Spirit of the Game' is not just a soccer story. It does have a backdrop of soccer to tell the hero's journey of Jamie Steele. Jamie is mentored along the way by the guardian angel spirit of the legendary Sir Stanley Matthews. 'Spirit of the Game' is therefore intended as a project that reflects the socially real worlds of 'Billy Elliot' or 'Bend it Like Beckham'; with the magic and longevity of the inspirational 'It's a Wonderful Life'; and with the outstanding production values and creative integrity of all the great Walt Disney classics of the far distant past. But we do need your support to make it happen. Animation is a time intensive yet cost effective process, although we are not talking about the insane level of budgeting that is the norm for animated films in Hollywood these days. Instead we are talking about creative integrity and financial sacrifice. Top talents who are hoping to to work on the film will give their utmost endeavors - but will do so for minimal fees that Hollywood can barely dream of. 'Spirit of the Game' is truly a film from the heart. From many hearts in fact. It marks a return to the magic of classical animated storytelling - but in a way that addresses the realities of the world we all live in today. We therefore invite you to help us in what we're trying to do, so we are able to create something that is really valuable and inspirational! I thank you for doing all you can to help this particular personal dream come true!" Tony White is a British Academy Award-winning animation director, animator, author, educator and mentor. At the beginning of his career, he studied advanced animation techniques with some of the finest masters of the art-form. Specifically: Ken Harris (original lead animator of "Bugs Bunny," "Roadrunner," etc. ), Art Babbit (original lead animator on "Pinocchio," "Fantasia," etc.) and Richard Williams (3 times Oscar winner and author of "The Animator's Survival Kit"). Tony's first taste of working for the big screen came when he wrote, designed and animated the award-winning title sequence for "The Pink Panther Strikes Again" movie. Having successfully run his own award-winning animation in studio in London, Animus Productions, for 20 years Tony moved to Seattle in 1998 to live, work and teach. Currently Tony teaches part-time at the Cornish College of the Arts in Seattle, and privately though the TakeLessons online platform. This provides him with more time to work consistently on the projects he still dreams of making, most notable of which is 'Spirit of the Game'. Tony is also founder of "DRAWASSIC", a ground-breaking, internet-based animation studio - the mission of which is to preserve, teach and evolve the art-form of traditional animation in this digital age. In 2018, he has taken his cherished "Golden Pencil Award" event online for the very first time. Tony's current best-selling books include: "The Animator's Workbook"; "Animation from Pencils to Pixels ~ Classical Techniques for Digital Animators"; "How To Make Animated Films", "The Animator's Job Coach", "The Animator's Notebook" and "Motion Comics".